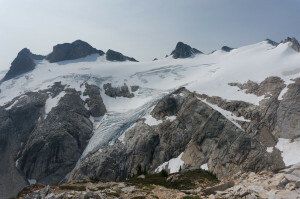 Snowking is not especially tall, but it is striking landmark as its broad northeast face and location on the far western edge of the Cascades make it home to an unusually large amount of glacier. 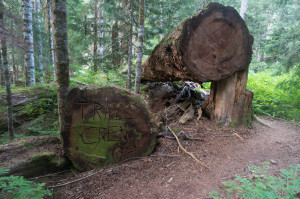 I was looking for an easy day, and Snowking was roughly in the area, so I drove the 20 miles up Illabot Creek Road to the small Slide Creek trailhead. Most people apparently approach from the other side via Kindy Ridge, but this looked no harder and less out of my way. I found a nice camping pull-out, rolled down a few windows for air in the heat, and hung out for a bit before turning in. Sometime before dawn, I woke to furtive rustling and scurrying sounds, and suspected there was a mouse in my car. Clearly, I had not fully appreciated the implications of seeing one above the rear window a couple weeks earlier. I had read an anecdote about Norman Clyde having a mouse stowaway in his station wagon, but now it seemed I would get some firsthand experience. I almost fell asleep, startled awake as it scurried past my head, then lay down unhappily until it got light, when I decided to deal with this problem later, and headed for the peak. 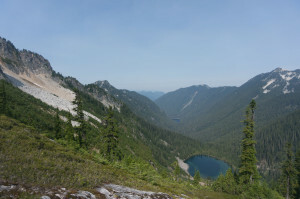 While not often used by climbers, Slide Lake is popular with hunters and fishermen, and the trail is well-used and -maintained. Passing the lake, I passed two men and a young boy eating a late breakfast, with various fishing paraphernalia strewn about camp. I passed a couple more fire rings and a discouraging amount of trash as I made my way to the head of the lake. I initially tried thrashing through some head-high ferns up high, but eventually wised up and returned to the inlet stream, where a decent, well-flagged trail led through the woods to Enjay Lake. The trail faded and ended past another trash-strewn fire ring, so I boulder-hopped around to the eastern end of the lake, passed a smaller puddle, and headed up a dry watercourse toward the ridge above. After a bit of a cliff problem, overcome by a short, desperate vegetation scramble, easier heather, slabs, and snow led to a small col with my first view of Snowking. Along the way, I was somewhat surprised to see the occasional semi-recent bootprint. 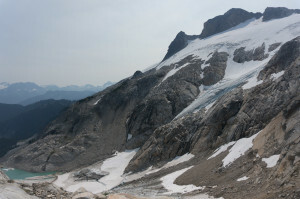 The route from here is obvious: down the grassy ramp to the snowfield, up a diagonal snow tongue to the glacier, up to the right of the major crevasse area, then along the flat top to the base of the summit boulders. There was plenty of surface slush to make crampons unnecessary as I zigzagged between a couple of crevasses toward the lower central summit. Too much slush, in fact, as walking through a slurpee in thin cotton socks quickly chilled my feet. Therefore instead of doing the obvious snow traverse toward the summit, I got back onto rock as soon as possible, on the far righthand side. From here, generally loose and annoying boulders led to the top. Examining my surrounding, I was surprised to see a party of three making their way down the snow southeast of the peak, presumably returning via the Kindy route. I had neither heard nor seen any sign of them on my way up; perhaps I was rocking out too hard with my awesome new headphones. Anyways, after lounging around for a bit, partly catching up on mouse-denied sleep, I retraced my steps, using a slightly different bit of 4th class brush on the way down. 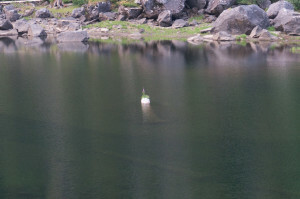 Passing Slide Lake, I was immensely pleased to see a man lounging and fishing in a yellow rubber raft. It’s only a mile and a half in, but still… good thinking! This entry was posted in Washington. Bookmark the permalink.